What do we mean when we talk about land stewardship? Generally defined, it’s the conducting, supervising, or managing of something; especially the careful and responsible management of something entrusted to one’s care. That’s an impressive responsibility, especially when our members have contributed their own financial resources to help Sycamore protect more land. And that is why I take this job so seriously. People have entrusted Sycamore to care for the beautiful natural places we all depend on. I think we all share in that responsibility! We all must care for the land that we will leave to future generations. Now, how we manage and care for that land isn’t easy to define, and strategies are often hotly debated in the conservation community. Staff and the stewardship committee are continually working on that very question to see how we can best care for the land entrusted to us. In addition to our land management duties, we also work on keeping preserves open to the public. 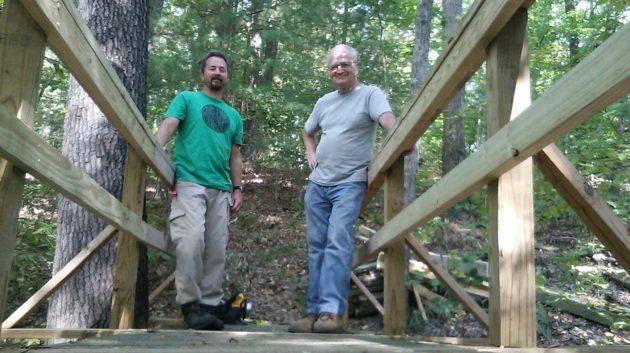 During this past fall, I have been busy conducting annual property visits for our 4,000 acres of conservation easements, and repairing bridges, boardwalks, and other structures that make our nature preserves accessible to the public. I love the challenges I face in my job, because in the end, it’s all so rewarding. And it’s my pleasure to serve our members and visitors so that all may get in touch with the great outdoors. To visit a nature preserve near you, check out sycamorelandtrust.org/visit-a-preserve. And thanks to our members for enabling us to steward 9,320 acres of nature (and counting)! Check out future issues of The Twig for more in-depth updates on specific projects Chris has been working on!